Colombia is a unitary republic made up of thirty-two departments (Spanish: departamentos, sing. departamento) and a Capital District (Distrito Capital). Each department has a Governor (gobernador) and a Department Assembly (Asamblea Departamental), elected by popular vote for a four-year period. The governor cannot be re-elected in consecutive periods. Departments are country subdivisions and are granted a certain degree of autonomy. Departments are formed by a grouping of municipalities (municipios, sing. municipio). Municipal government is headed by mayor (alcalde) and administered by a Municipal Council (concejo municipal), both of which are elected for four-year periods. Some departments have subdivisions above the level of municipalities, commonly known as provinces. 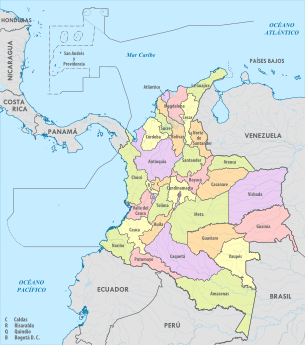 Each one of the departments of Colombia in the map below links to a corresponding article. Current governors serving four-year terms from 2015 to 2019 are also shown, along with their respective political party or coalition. Estimate for Cundinamarca includes the Capital District. The indigenous territories are at the third level of administrative division in Colombia, as are the municipalities. Indigenous territories are created by agreement between the government and indigenous communities. In cases where indigenous territories covering more than one department or municipality, local governments jointly administer them with the indigenous councils, as set out in Articles 329 and 330 of the Colombian Constitution of 1991. Also indigenous territories may achieve local autonomy if they meet the requirements of the law. Article 329 of the 1991 constitution recognizes the collective indigenous ownership of indigenous territories and repeats that are inalienable. Law 160 of 1994 created the National System of Agrarian Reform and Rural Development Campesino, and replaced Law 135 of 1961 on Agrarian Social Reform; it establishes and sets out the functions of INCORA, one of the most important being to declare which territories will acquire the status of indigenous protection and what extension of existing ones will be allowed. Decree 2164 of 1995 interprets Law 160 of 1994, providing, among other things, a legal definition of indigenous territories. Indigenous territories in Colombia are mostly in the departments of Amazonas, Cauca, La Guajira, Guaviare and Vaupés. When it was first established in 1819, República de la Gran Colombia had three departments. Venezuela, Cundinamarca (now Colombia) and Quito (now Ecuador). In 1824 the Distrito del Centro (which became Colombia) was divided into five departments, and further divided into seventeen provinces. One department, Istmo Department, consisting of two provinces later became Panama. With the dissolution of Gran Colombia in 1826 by the Revolution of the Morrocoyes (La Cosiata), New Granada kept its 17 provinces. In 1832 the provinces of Vélez and Barbacoas were created, and in 1835 those of Buenaventura and Pasto were added. In 1843 those of Cauca, Mompós and Túquerres were created. At this time the cantons (cantones) and parish districts were created, which provided the basis for the present-day municipalities. By 1853 the number of provinces had increased to thirty-six, namely:Antioquia, Azuero, Barbacoas, Bogotá, Buenaventura, Cartagena, Casanare, Cauca, Chiriquí, Chocó, Córdova, Cundinamarca, García Rovira, Mariquita, Medellín, Mompós, Neiva, Ocaña, Pamplona, Panamá, Pasto, Popayán, Riohacha, Sabanilla, Santa Marta, Santander, Socorro, Soto, Tequendama, Tunja, Tundama, Túquerres, Valle de Upar, Veraguas, Vélez and Zipaquirá. However, the new constitution of 1853 introduced federalism, which lead to the consolidation of provinces into states. By 1858 this process was complete, with a resulting eight federal states: Panamá was formed in 1855, Antioquia in 1856, Santander in May 1857, and Bolívar, Boyacá, Cauca, Cundinamarca and Magdalena were formed in June 1858. 1861 saw the creation of the final federal state of Tolima. ^ a b "Division Política de Colombia" (in Spanish). Portal ColombiaYA.com. Archived from the original on 10 March 2009. ^ Decree 2164 of 1995 provides "Reserva Indígena. Es un globo de terreno baldío ocupado por una o varias comunidades indígenas que fué delimitado y legalmente asignado por el INCORA a aquellas para que ejerzan en él los derechos de uso y usufructo con exclusión de terceros. Las reservas indígenas constituyen tierras comunales de grupos étnicos, para los fines previstos en el artículo 63 de la Constitución Política y la ley 21 de 1991. […] Territorios Indígenas. Son las áreas poseidas en forma regular y permanente por una comunidad, parcialidad o grupo indígena y aquellas que, aunque no se encuentren poseidas en esa forma, constituyen el ámbito tradicional de sus actividades sociales, económicas y culturales. " Art. 21: "Los resguardos son una institución legal y sociopolítica de carácter especial, conformada por una o más comunidades indígenas, que con un título de propiedad colectiva que goza de las garantías de la propiedad privada, poseen su territorio y se rigen para el manejo de éste y su vida interna por una organización autónoma amparada por el fuero indígena y su sistema normativo propio." ^ Guhl Nannetti, Ernesto (1991). "Capítulo XII: División Política de la Gran Colombia". Las fronteras políticas y los límites naturales: escritos geograficos [Political Boundaries and Their Natural Limits: Geographic writings] (in Spanish). Bogotá: Fondo FEN. ISBN 978-958-9129-22-7. ^ a b Aguilera Peña, Mario (January 2002). "División política administrativa de Colombia". Credential Historia (in Spanish). Bogotá: Banco de la República. Archived from the original on 16 February 2011. ^ a b Oficina Nacional de Estadística (Office of National Statistics) (1876). "Estadística de Colombia" [Colombian Statistics] (PDF) (in Spanish). Bogotá: Oficina Nacional de Estadística. Retrieved 23 November 2016. ^ Domínguez, Camilo; Chaparro, Jeffer; Gómez, Carla (2006). "Construcción y deconstrucción territorial del Caribe Colombiano durante el siglo XIX". Scripta Nova (Revista Electrónica de Geografía y Ciencias Sociales). 10 (218 (75)). The Amazonas Department (Spanish: Departamento del Amazonas, Spanish pronunciation: [amaˈsonas]) is a department of Colombia in the south of the country. It is the largest department in area while also having the 3rd smallest population. Its capital is Leticia and its name comes from the Amazon River, which drains the department. Atlántico (Spanish pronunciation: [atˈlantiko], English: Atlantic) is a department of Colombia, located in northern Colombia with the Caribbean Sea to its north, the Bolívar Department to its west and south separated by the Canal del Dique, and the Magdalena Department to its east separated by the Magdalena River. It is the third-smallest of the country's departments but its population of 2,272,170 makes it one of the most densely populated. Its capital is Barranquilla. Other important cities include Soledad and Malambo. Caldas (Spanish pronunciation: [ˈkaldas]) is a department of Colombia named after Colombian patriotic figure Francisco José de Caldas. It is part of the Paisa Region and its capital is Manizales. The population of Caldas is 1,030,062, and its area is 7,291 km². Caldas is also part of the Colombian Coffee-Growers Axis region along with the Risaralda and Quindio departments. Caquetá Department (Spanish pronunciation: [kakeˈta]) is a department of Colombia. 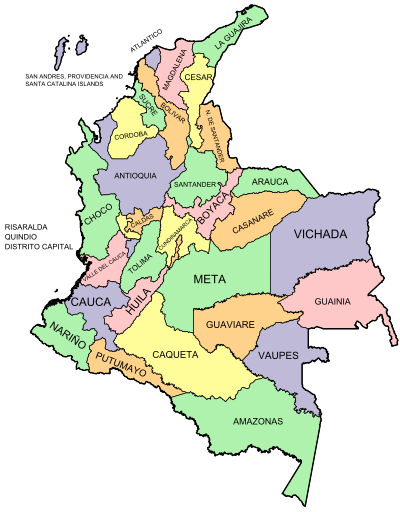 Located in the Amazonas region, Caquetá borders with the departments of Cauca and Huila to the west, the department of Meta to the north, the department of Guaviare to the northeast, the department of Vaupés to the east, the departments of Amazonas and Putumayo to the south covering a total area of 88,965 km², the third largest in the country. Its capital is the city of Florencia. Casanare Department (Spanish pronunciation: [kasaˈnaɾe], Spanish: Departamento de Casanare) is a department in the central eastern region of Colombia. Its capital is Yopal, which is also the episcopal seat of the Roman Catholic Diocese of Yopal. It contains oil fields and an 800 km pipeline leading to the coastal port of Coveñas owned by BP. Córdoba Department (Spanish pronunciation: [ˈkoɾðoβa], Spanish: Departamento de Córdoba) is a Department of the Republic of Colombia located to the north of this country in the Colombian Caribbean Region. Córdoba faces to the north with the Caribbean Sea, to the northeast with the Sucre Department, east with the Bolívar Department and south with the Antioquia Department. Its capital is the city of Montería. The Government entities of Colombia (Spanish: Entidades Gubernamentales de Colombia) are entities of the government of Colombia. The government entities is made up by commissions, control agencies, administrative departments, directorates, funds, superintendencies, among other. Some of these agencies are under the supervision of the President of Colombia with special autonomy. Guaviare (Spanish pronunciation: [ɡwaˈβjaɾe]) is a department of Colombia. It is in the southern central region of the country. Its capital is San José del Guaviare. Guaviare was created on July 4, 1991 by the new Political Constitution of Colombia. Up until that point, it was a national territory that operated as a Commissariat, segregated from territory of the then Commissariat of Vaupés on December 23, 1977. Huila (Spanish pronunciation: [ˈwila]) is one of the departments of Colombia. It is located in the southwest of the country, and its capital is Neiva. This is a list of Colombian departments by gross domestic product in 2016. Meta (Spanish pronunciation: [ˈmeta]) is a department of Colombia. It is close to the geographic center of the country, to the east of the Andean mountains. A large portion of the department, which is also crossed by the Meta River, is covered by a grassland plain known as the Llanos. Its capital is Villavicencio. The department has a monument placed in the very geographic centre of Colombia, at a place known as Alto de Menegua, a few kilometers from Puerto López. Achagua, which is similar to Piapoco, is an Indigenous language spoken by a minority in the department. Nariño (Spanish pronunciation: [naˈɾiɲo]) is a department of Colombia named after independence leader Antonio Nariño. Its capital is Pasto. It is in the west of the country, bordering Ecuador and the Pacific Ocean. Nariño has a diverse geography and varied climate according to altitude: hot in the plains of the Pacific and cold in the mountains, where most of the population resides, a situation that is repeated in a north-south direction. Other important cities include Tumaco and Ipiales. Putumayo (Spanish pronunciation: [putuˈmaʝo]) is a department of Colombia. It is in the south-west of the country, bordering Ecuador and Peru. Its capital is Mocoa. The word putumayo comes from the Quechua languages. The verb p'utuy means "to spring forth" or "to burst out", and mayu means river. Thus it means "gushing river". Risaralda (Spanish pronunciation: [risaˈɾalda]) is a department of Colombia. It is located in the western central region of the country and part of the Paisa Region. Its capital is Pereira. Vaupés (Spanish pronunciation: [bawˈpes]) is a department of Colombia in the jungle covered Amazonas Region. It is located in the southeast part of the country, bordering Brazil to the east, the department of Amazonas to the south, Caquetá to the west, and Guaviare, and Guainía to the north; covering a total area of 54,135 km². Its capital is the town of Mitú. Vichada Department (Spanish: Departamento del Vichada, Spanish pronunciation: [biˈtʃaða]) is a department of the Republic of Colombia in South America. Vichada is located in the eastern plains of Colombia, in the Orinoquía Region within the Orinoco river basin bordering the Bolivarian Republic of Venezuela to the north and east. To the north the department also borders with Arauca Department, to the northwest with Casanare Department, to the west with Meta Department, to the southwest narrowly bordering with Guaviare Department and to the south with Guainía Department. The department is the second largest in Colombia and scarcely populated in comparison to other departments.